Saturday, May 10th is the evening for one of the most fun and exciting events at our church. This year, we are opening the event to the public. 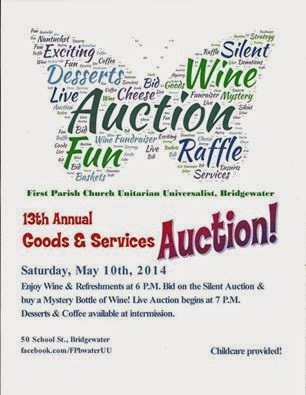 Wine & Cheese, Silent Auction, and Wine Pull is at 6 pm and the Live Auction begins at 7 pm with a live auctioneer! Start off with a glass of wine and nourishing (ha) snacks to energize. Bid on the silent auction items, of which there are always difficult choices, and figure out your bidding strategy. Select a mystery bottle of wine for $20 and take a chance of getting a bottle valued at 4x that amount! And did you buy a raffle ticket for a trip to Nantucket? You will! Then take a seat and let the live auction begin. There are wonderful things to eat, fun places to go, beautiful crafts, and useful services. All for sale to the highest bidder. Child care will be available.